18.2.2018 Miek, you’re alive! He’s alive, guys. 18.2.2018 Now those foundations are gone. Sorry. Odin: Asgard is where our people stand. Even now, right now, those people need your help. Thor: I'm not as strong as you. 18.2.2018 Asgard is where our people stand. Thor: She's too strong. Without my hammer, I can't. Odin: Are you Thor, the God of Hammers? 18.2.2018 Are you Thor, the God of Hammers? Bruce Banner: I don't know how to fly one of these. 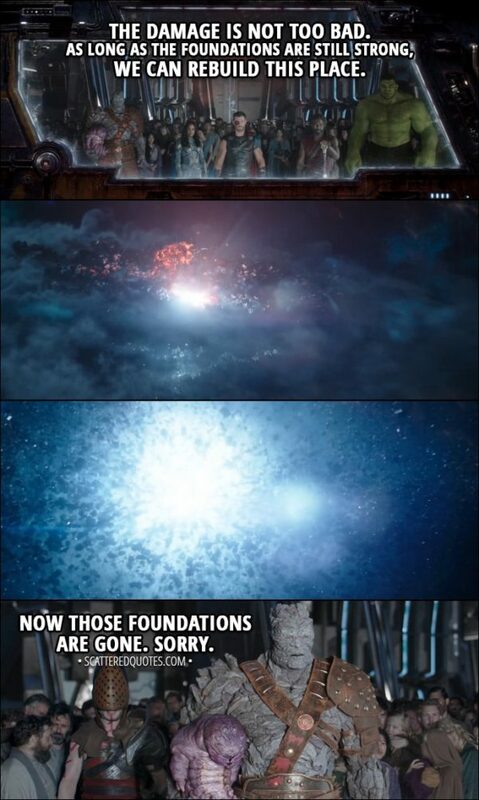 Thor: You're a scientist. Use one of your PhDs. Bruce Banner: None of them are for flying alien spaceships! 18.2.2018 You’re a scientist. Use one of your PhDs. 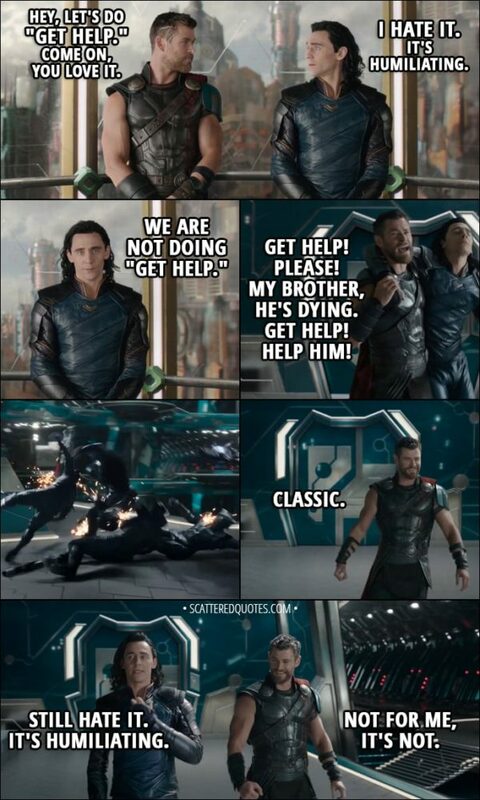 Thor (to Loki): Dear brother, you're becoming predictable. I trust you, you betray me. Round and round in circles we go. See, Loki, life is about... It's about growth. It's about change. But you seem to just wanna stay the same. I guess what I'm trying to say is that you'll always be the God of Mischief, but you could be more. 18.2.2018 Predictable. I trust you, you betray me. 18.2.2018 Hey, let’s do “Get Help.” Come on, you love it. Thor: This place is perfect for you. It's savage, chaotic, lawless... Brother, you're gonna do great here. Loki: Do you truly think so little of me? Thor: Loki, I thought the world of you. I thought we were gonna fight side by side forever. But at the end of the day, you're you and I'm me. I don't know, maybe there's still good in you. But let's be honest, our paths diverged a long time ago. Loki: Yeah. It's probably for the best that we never see each other again. Thor: It's what you always wanted. 18.2.2018 Brother, you’re gonna do great here. Topaz: The arena's mainframe for the Obedience Disks have been deactivated and the slaves have armed themselves. Grandmaster: I don't like that word. Grandmaster: No. Why would I not like "mainframe"? No, the "S" word. Topaz: Sorry, the prisoners with jobs have armed themselves. 18.2.2018 The prisoners with jobs have armed themselves. Thor: There was one time when we were children, he transformed himself into a snake, and he knows that I love snakes. So, I went to pick up the snake to admire it, and he transformed back into himself and he was like, "Yeah, it's me!" And he stabbed me. We were eight at the time. Thor: I'm saying that I wanna be on the team. Valkyrie: Has it got a name? Thor: Yeah, it's called the Revengers. 18.2.2018 It’s called the Revengers. Thor: You and I had a fight recently. Thor: No, I won. Easily. Bruce Banner: Doesn't sound right. 18.2.2018 Did I win? – No, I won. Easily. Bruce Banner: What happened to your hair? Thor: Some creepy old man cut it off. Bruce Banner: It looks good. 18.2.2018 Some creepy old man cut it off. Thor (to Valkyrie): Keep drinking, keep hiding. But me... I choose to run toward my problems and not away from them. Because that's what... Because that's what heroes do. 18.2.2018 Keep drinking, keep hiding. 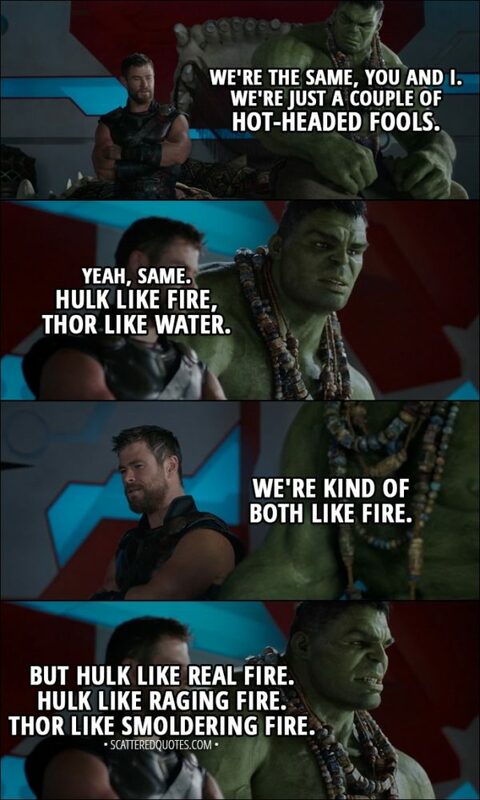 18.2.2018 Hulk like fire, Thor like water.